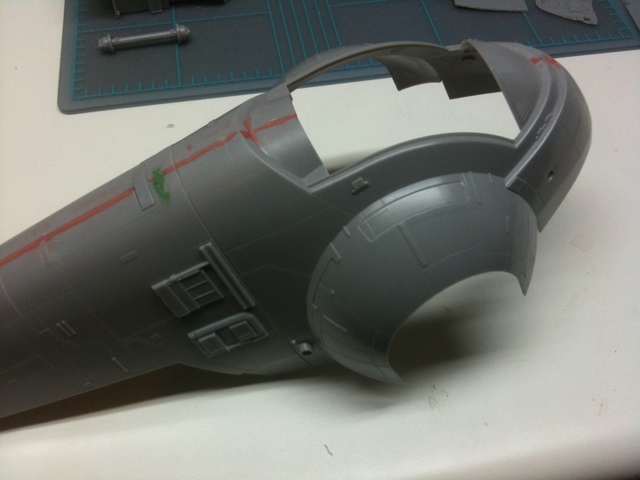 The goal of this project is to construct a 1/72 scale model of Boba Fett’s ship, Slave I, as seen in The Empire Strikes Back. 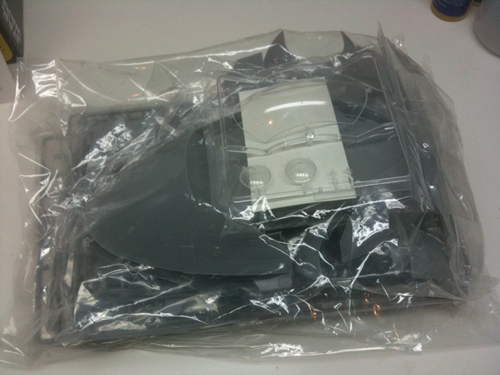 This particular model is made by a company called Fine Molds. Over the last few years, they’ve made a great line of Star Wars models. I picked up mine from a great site, Hobby Link Japan. This is the first time in probably fifteen years that I’ve built an actual model (i.e. 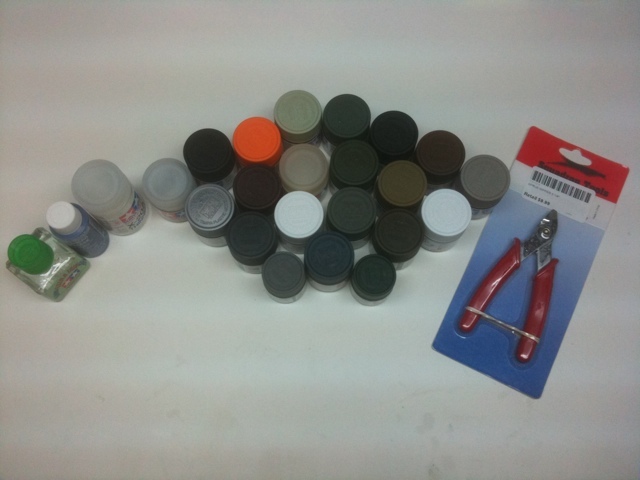 not a prop kit) so I’m sure I’ve got a lot to learn when it comes to construction, but mostly painting and weathering. So stay tuned. This promises to get interesting. So while things have been pretty busy, I managed to steal a few minutes at my workbench today. I didn’t get a whole lot accomplished, but I did manage to unpack the model and take a quick inventory. Overall, the model looks great. 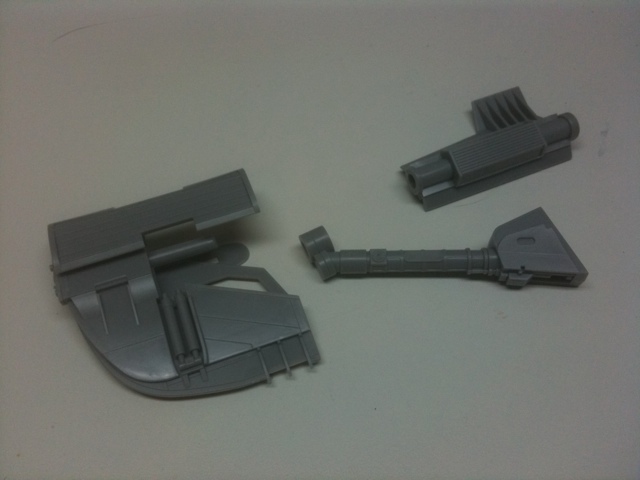 All the pieces are very crisp and finely detailed. 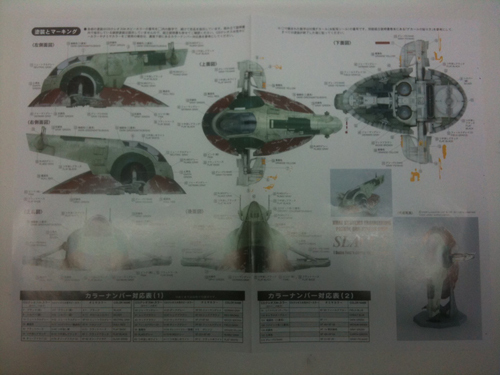 The instructions, while written in Japanese, have excellent exploded drawings, clearly illustrating the model’s assembly. Also included is a large color print, which details the painting scheme and provides a comprehensive list of the various colors needed. ‘Looks like I’m going to need to pick up some supplies! 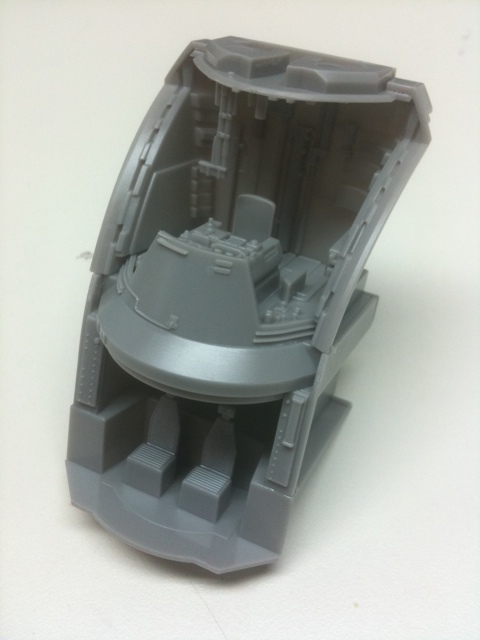 Following the instructions, the first assembly to put together is the cockpit. The assembly is composed of three subassemblies: the pilot’s console, the passenger seats below, and the surrounding bulkheads. The entire thing went together very quickly and easily. 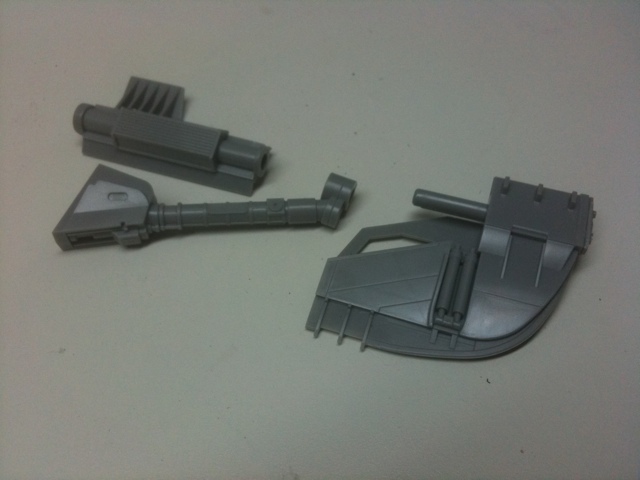 ‘Just snapped the parts off the sprue using my sprue cutters, filed down the excess material, and glued everything together using Tamiya thin cement, which worked really well. I’ve decided to tackle all the assembling before I dive into painting. Next up are the wings! Next up are the wings. 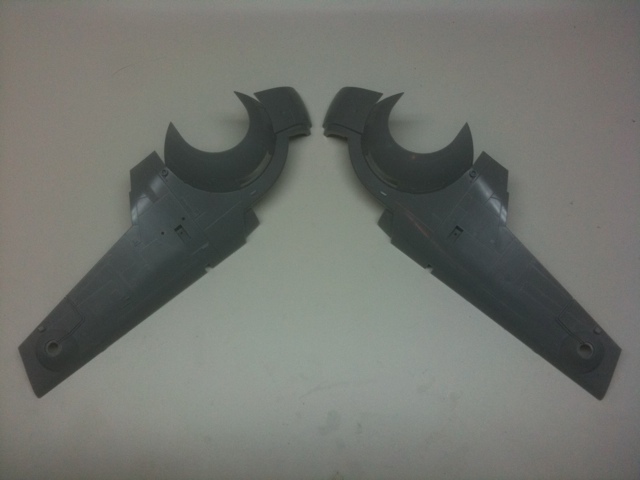 Each wing is comprised of three subassemblies: what I’ll call the outer wing, the strut, and the inner wing. There are a handful of parts for each subassembly, so progress was a little slower today, but I managed to get one wing assembled. 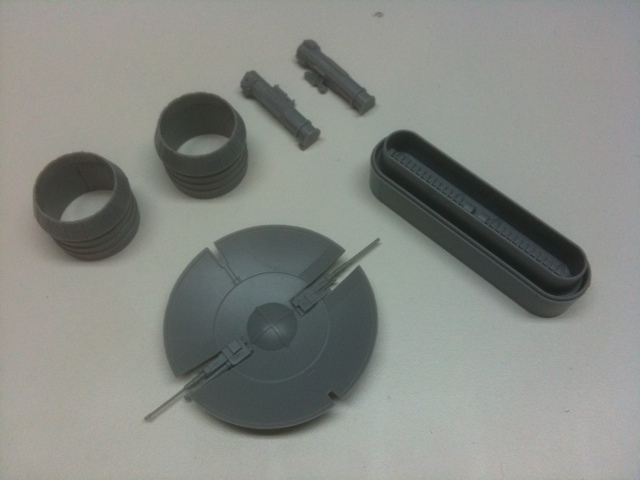 Following the advice of this article at Starship Modeler, I decided to keep the three parts separated until after painting. Today, I finished up the right wing subassemblies, which are basically a mirror image of the left side I completed earlier. Each wing has a rod that is to slide through the support strut into the third piece, which I’ll refer to as the wing mount. The wing is supposed to rotate freely through the support strut so that the wings can be displayed in either the horizontal or vertical positions. A quick test-fit showed the fit through the strut was a little tight, so I had to file down the rod and the inner diameter of the strut section to get a good fit. After the wings were finished, I moved onto the fuselage. 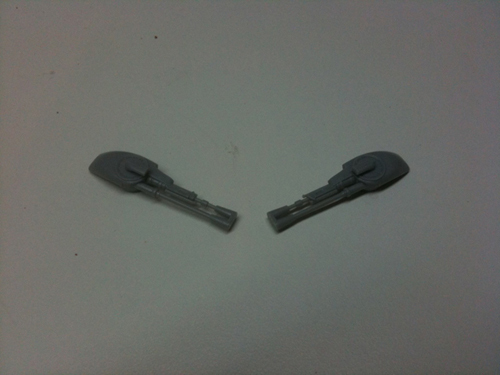 I separated the two halves from the sprue, and filed down the minor flash that was left over. Overall, the two pieces look pretty good, although the right half does have some rough spots around the upper canopy area that I’ll mostly likely need to putty over. This isn’t a huge deal as I plan on puttying over the seam that will run down the length of the fuselage once the two halves have been put together. I’ll leave that for next time though. Anyway, I managed to get back to Slave I today. 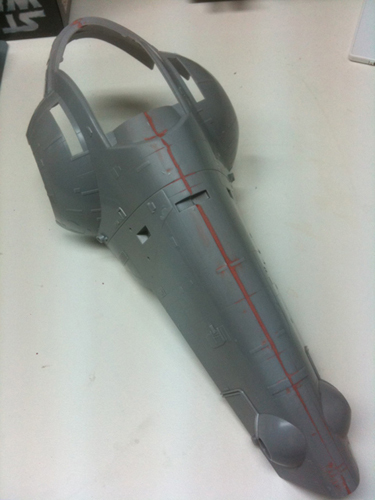 After having puttied and sanded the main seam between the fuselage halves, I had to rescribe some panel lines. I did this using a Tamiya scriber and a flexible ruler I picked up at Staples to use as a guide. It looks pretty good, but I won’t know for certain how well it worked until I apply the primer later on. Next, I added some of the detailing pieces along the hull, and I also attached the small piece that over-hangs the main cockpit area. Due to some misalignment I had with the fuselage halves, this piece didn’t sit quite right. I soaked it in some hot water until it softened, and then gently bent it into shape before gluing it into place. 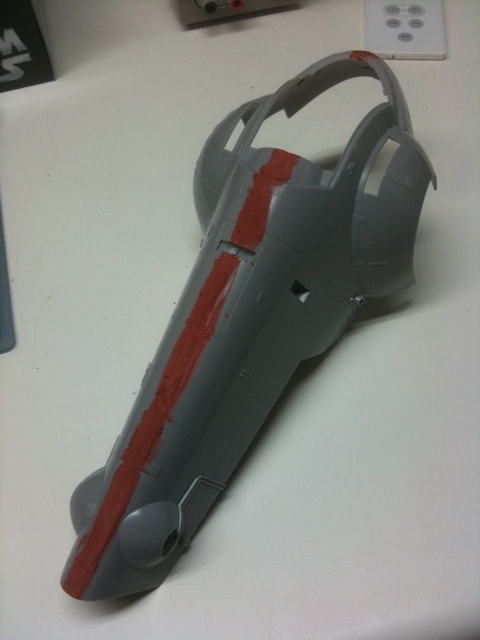 After being away from the workbench for awhile, I managed to get some work done on Slave I. Having completed the main fuselage and wing assemblies, it’s time to move onto detailing the undercarriage. As shown in the picture, I completed the subassemblies for the main engine, the two supporting engines, and some additional detailing pieces.